My festive excitement is building by the day! Our tree was delivered today and smells amazing, I can't wait to decorate it this weekend. Almost all of my Christmas shopping is done and I am planning for a big wrapping session on Sunday, although as usual I have far too many things planned for this weekend and I am positive that there are not enough hours to do it all! We fly to Australia for Christmas 3 weeks tomorrow, I can't believe how quickly this year has gone and how fast this trip is approaching. I have had hot Christmases before, and Hong Kong Christmases which are neither hot nor cold which is just an annoying middle ground, but this will be my first time visiting Australia and experiencing a barbecued Christmas dinner. It's going to be great, I can't wait. So as Christmas dinner is going to be rather different this year I have been thinking of some recipes that are more suited to a summer Christmas, and this easy no-churn ice cream recipe seems like a good compromise. It has all the flavour of traditional Christmas pud and I can definitely imagine myself indulging in this whilst relaxing on the terrace of our beach house. However, if celebrating Christmas in the nothern hemisphere it would be equally yummy paired with a hot pudding or cake. Fold in the spices, brandy, and vanilla until totally combined. Fold in the condensed milk and then beat again until it has thickened up a bit. The cream won't go as stiff as it was before you added the condensed milk, but it will thicken slightly, to a soft peak stage. Fold in the Christmas pudding pieces and then pour into a metal loaf tin**. Cover with foil or cling film and freeze overnight. *I used two of the individual Christmas puddings from Marks and Spencer. **When I was testing this recipe I did a version where I swirled 6 Tbsp of salted caramel sauce through the mixture before freezing. It tasted good but was a bit too sweet for me. If you have a very sweet tooth then give it a go. You can get the recipe for salted caramel sauce here. 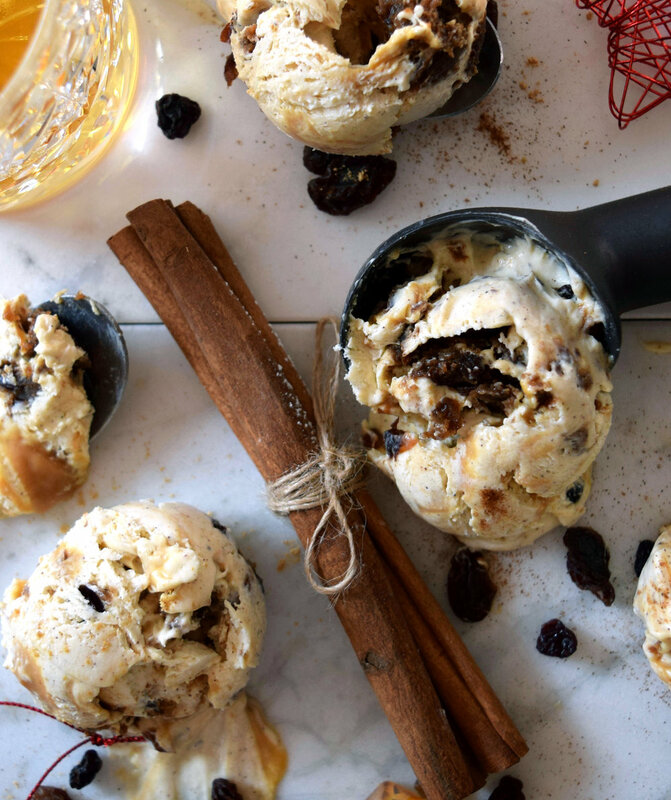 Christmas pudding ice cream - an alternative way to enjoy Christmas pudding.